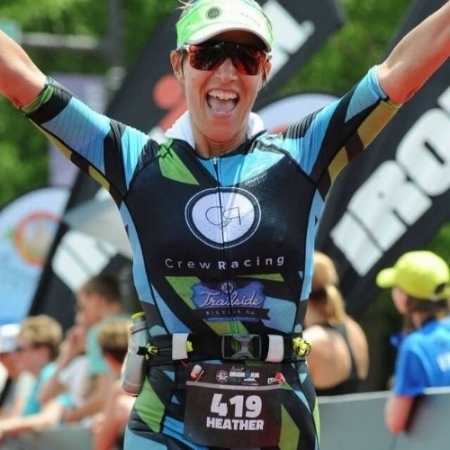 Crew Racing deeply believes in an individualized training approach with each athlete. We believe in healthy habits, strong bodies, and incorporating your training into your lifestyle. Incremental, personal growth throughout one’s fitness journey is what enables each individual to develop the knowledge, skills, and abilities to perform to their best potential come race day. With Caitlin’s background in human performance and exercise science, and as a physical therapist, she is able to develop a comprehensive training regimen focused at improving sport specific skill set while avoiding injury. Drew’s extensive background in swimming, with many first out of the water accolades, can not only can help to improve limiters in the swim, but also provide valuable insight on how to strategically place emphasis on swim training. Crew Racing gives unlimited access to Caitlin and Drew, as they love to work together with each athlete to provide an efficient, all-inclusive training approach. What the Crew Racing coaches are most proud of since the launch of Crew Racing in 2014 is the sense of community the team has built. We like to think of our athletes as a part of our, “Crew.” The team comradery is unbelievable, fostered by each athlete to make our team strong, resilient, and confident. While understanding each athlete comes with specific needs and goals, communication is always unlimited while Caitlin and Drew give all of their athletes the same attention to detail. However, they also understand that this sport doesn’t come without injury and special consideration to injury prevention and management. With this, your plan will have a greater emphasis on addressing areas of weakness or limitation by Caitlin. All coaching offered by Crew Racing is individual to each athlete. Becoming a part of the Crew gives you access to our private Facebook group and our training log, Final Surge. Baseline fitness assessments are performed to determine appropriate exercise prescription. We also offer a periodized strength training program developed by Caitlin. The premium coaching package offers unlimited communication and access to your coach. We also understand that family, work schedule, and life can conflict with your workout regimen. With this, we are here to offer workout modifications as needed to best maintain a healthy training: lifestyle balance. This package is written in 2-3 week cycles along with frequent feedback from your coach. As part of our dedication to your training, we ask each athlete to maintain an open line of communication and provide as much feedback on workouts as possible. If you find your seasons have continued to be plagued by injury, this is the coaching package for you. This has everything the premium package has to offer with special consideration to injury prevention and management. Caitlin will use clinical judgement and skills, a preventative strength and mobility program, and specific training to address your areas of limitation to promote an injury free season. This package is appropriate for the return to sport athlete who is looking to return to racing after extended time off due to injury or even surgery. Special consideration is made to each athlete to foster a healthy environment for a return to maximum potential in sport. All training is designed by a Doctor of Physical Therapy and USAT Certified Coach. A consultation is free. Do not hesitate to reach out and see if Crew Racing is a good fit for your fitness journey!